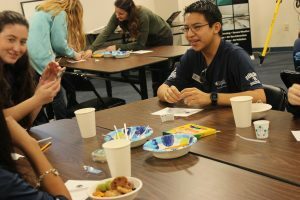 On February 26th, the Making Waves Teen STEM Café of the Texas State Aquarium in Corpus Christi hosted its Café on the topic of lightning and the global electric circuit. During this Café, our guest speaker was Thomas Lavigne. Mr. Lavigne is a Ph.D student at Texas A&M University—Corpus Christi that currently researches atmospheric science and the global electric circuit. Mr. Lavigne also brought along some of his fellow graduate students to share some of their research as well. He explained that lightning is constantly occurring throughout the world and is connected to a giant electric circuit that circles our globe! The lightning helps charge the electric circuit. 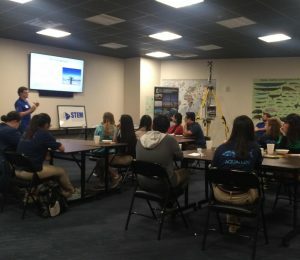 Many of us did not know of the importance of lightning, and Mr. Lavigne answered various questions that the attendees had. The coolest part of the café was seeing the instruments Mr. Lavigne uses to do his research. Everyone was amazed with the lightning research equipment that Mr. Lavigne brought with him. He showed us of how they work and what they provide for their research. 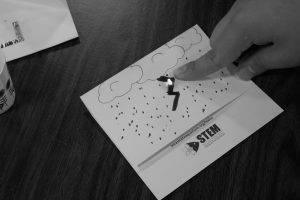 All that attended had an amazing time at the Teen STEM Café, and as we went home with our electric circuits used in the activity, you could almost be sure that there may be future meteorologists among those that attended. Before he began his talk, Thomas had everyone create handmade electric circuits using lithium batteries, LED lights, and copper tape. We then learned how to conduct electricity to a small light bulb using both positive and negative charges from the battery, connected by copper tape. He then used this activity to describe how the global electric circuit and lighting work. When positive and negative charges separate in the clouds, the result is lightning. The activity turned out to be very interesting and fun for everyone.